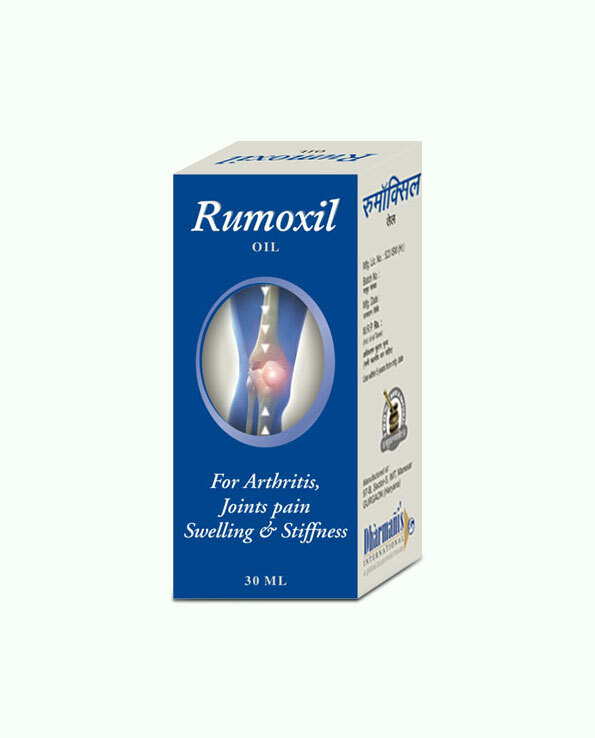 Rumoxil oil is the most efficient ayurvedic joint pain relief oil that helps to reduce joint stiffness and swelling. This herbal anti-inflammatory oil strengthens joints to prevent problems in future. Rumoxil oil is excellent herbal oil for joint stiffness and also for promoting joint endurance, strength and stability. This ayurvedic joint pain relief oil not only curbs pain and swelling which causes stiffness, but also improves functions and strength of ligaments to improve joint alignment and stability and nerve functions to improve control over joint movement. This ayurvedic joint pain relief oil is beneficial for ageing individuals, people suffering with arthritis and other disorders, and for those who lead strenuous lifestyle to gain trouble-free joints. Rumoxil oil is herbal formula which goes deep into skin and enhances nutrition and oxygen supply and also immune system’s reach by promoting blood flow. Immune system prevents infections from affecting joints to cause pain and stiffness, and higher flow of blood enhances tissue generation. Properties of this oil also prevent shedding of bones and maintain healthy joint mechanism. By nourishing ligaments and muscles this oil maintains proper alignment and joint stability. The herbal ingredients of this ayurvedic joint pain relief oil also protect cartilages from damages due to bone atrophy and by maintaining synovial fluid clean. This ayurvedic joint pain relief oil even initiates process of rebuilding cartilages which reverse damages caused by arthritis and other issues like shedding of bones, fractures, gout, RA etc. 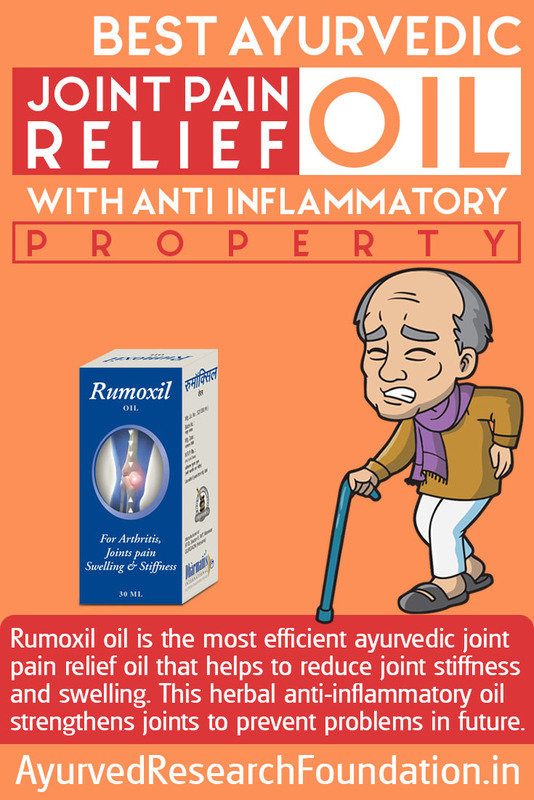 Rumoxil oil contains powerful anti-inflammatory herbs which diffuse swelling and promote blood flow. This ayurvedic joint pain relief oil contains herbs which numb pain-signal carrying nerves and provide quick relief from pain. Applications of this herbal oil for joint stiffness provide movement and on regular use strengthen joints to prevent problems in future. The properties of this ayurvedic joint pain relief oil to prevent cartilage damage and strengthen organs of joints including bones make it an effective remedy against arthritis and to treat backache, frozen shoulder, sciatica, rheumatic pain, and joint pain due to muscular sprains and pulls. Rumoxil oil improves nerve functions around joint which provides control over joint movement and prevents injuries due to dislocation and twisting of joints. Applications of this ayurvedic joint pain relief oil reduce joint stiffness and swelling and also treat warmth, redness and lethargy in joints effectively. Regular use of this oil increases range of motion and treat problems like weakness in joints and lesser weight bearing capacities. Use of this oil on regular basis keep a person agile and active for longer period in life by protecting joints from disorders, strain and weaknesses and healing injuries faster. Are this oil safe to use? Rumoxil oil is completely safe and fast-acting herbal oil to reduce joint stiffness and swelling. This is combination of herbs and herbal oils which makes it completely safe. Strict quality checks are employed while making this oil to ensure that no contamination or impurity accompanies final product and cause even mildest side effect. Rumoxil oil contains renowned herbs and herbal oils as ingredient, these are – Satt pudina and Kapur and oils of Dalchini, Jaiphal, Buleylu, Gandhapurna, Gandhapatri, Tarpin, Ajwain and Long. Collective effects of these herbs and herbal oils provide pain relief and diffuse swelling, and on regular use remove weaknesses in joint organs to keep them strong and enduring for longer period in life. Take Rumoxil oil in sufficient quantity and apply over affected joint. Rub oil with gentle hand for few minutes so that it gets absorbed in the skin. Repeat once in the morning and later in the evening. If pain is too severe you can repeat thrice in a day. This oil curbs pain and swelling in a short time. But to gain joint strength and reverse damages caused by disorders like arthritis one should use this regularly for 4 months. If you have suffered with joint weaknesses and disorders for a long time use for 6 months to gain maximum benefits. Diet supplying minerals, vitamins, fibre and healthy fat is recommended to maintain nutrition. Avoid hard to digest and acidic foods which can raise toxicity by slowing down digestion. Yes we do offer COD in India and also other easy to use options to make payments. You can send us cheque or DD or you can deposit in our account directly. You can also transfer through NEFT. Do not worry about your privacy we ensure it at each and every step. Product will be hand-delivered to you in a pack containing no details about the product inside. We use FedEx to ship our products and reach within 3 to 5 working days anywhere in India. I was looking for something to get relief from arthritis pain. Then I purchased Rumoxil oil and I am seeing some results. It’s taking the severe pain away. I have only been taking this for three weeks and I am looking forward to more benefits the longer I take it. Just started using Rumoxil massage oil recently, looking forward to positive results. So far, no negative effects!! Really surprised with such amazing results within 1 week of usage!! My knee pain was past. I highly recommend this if you want to get relief from pain and swelling. Works great, less pain and stiffness in the mornings. Works better than the other product I have been using it for 1 year. Amazing product for osteoarthritis problem!! I am seeing great results within two weeks of usage. Exercising daily is a part of my daily routine, and with time I got this joint pain. Then I’ve started using this oil and now I’ve have almost no lingering body pain, discomfort, no tension, and a noticeable increase in my feeling of well-being. This massage oil is just great. It gives a quick relief on pain and reduces joint stiffness. I’ve been taking this product for 4 months. I’ve seen an amazing amount of improvement in my overall health. This is a supplement that I’ll continue to use.